Sign up to test Multiplayer for Plague Inc: Evolved! Multiplayer for Plague Inc: Evolved is almost here and we are now looking for beta testers to get involved before we launch it - both to test game balance and network performance. We will start off with a small group of testers and then add more people to it until we are confident that it is ready to officially bring it to the game. The multiplayer game mode lets two players rampage across the world whilst humans do everything they can to try and save humanity. In a battle for genetic dominance, you must devise cunning strategies to out-evolve your opponent and exploit their weaknesses. Eventually, you will be strong enough to absorb your opponent and become the ultimate plague! early development screenshot - not final! Both you and your friend will both need to complete the application form, and mention each other during it. We will be accepting applications for the next two weeks – applications will close Friday 19th June 2015 and we will then select the first round of testers. 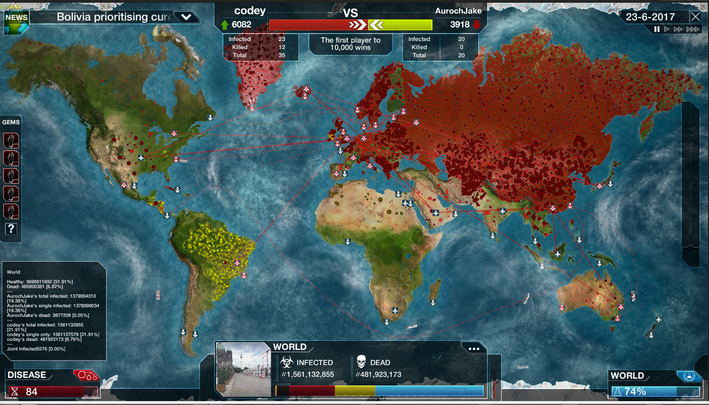 RE: Sign up to test Multiplayer for Plague Inc: Evolved! I am really intrigued which direction they choose to take this. Plague vs Plague and Plague vs Humanity sound like interesting modes, but I hope the infrastructure put in still allows for more multiplayer game modes (Different Plagues vs different plagues, more then two players, "Nemesis" One huge plague with an enormous advantage and the players represent factions trying to combat that one player). Will there be a mobile multiplayer?Or is it a steam exclusive? (23-09-2015 12:07 PM)tau1996 Wrote: Will there be a mobile multiplayer?Or is it a steam exclusive? Pls do a new round of multiplayer 'testers', waiting to get infected....! I saw an announcement on twitter today that stated multiplayer is practically fully functional just a few lag bugs and reassurance that it won't be long until release. But saying that if it were to be delayed, as I missed this announcement initially, I would love to test multiplayer also. They still say like "we're very busy with it" or "keep an eye out for an update"
but can't they just open the beta for everyone? Then they can easily track down lag spikes and bugs... more tests, more results, right? Don't you have some media to keep us busy? Youtube vids or some more screenshots?